These people endeavoured to live their lives in accordance with the teaching of Jesus in the New Testament. They rejected the authority of the established church and found no recorded mandate for infant baptism. For them total immersion was the only true baptism. Salvation was for all men and not only for the few chosen as 'elect'. From these tenets they were commonly known as 'General Baptists'. Locally they met for worship in small groups in barns or farmhouses until, in 1730, a wealthy member, Robert Chatfeild of Streat, acquired some land on which stood the present ancient cottage. Beside this he built a Meeting House. The entrance was from East End Lane. To the east was a meadow called 'Gunsfield'. Eventually Gunsfield was acquired by a grandson of Robert Chatfeild. In 1814 he and his brother built a day school for boys & girls alongside East End Lane. Seven years later, they set aside much of the meadow for use as a burial ground. The entrance to the Meeting House was then moved to its present position on the east side. Meantime, in 1806, the cottage had been extended to the south to accommodate the Minister and his family. By 1760 the original burial ground had become overcrowded with graves. It was then that Peter Browne, who lived on the other side of Gunsfield, set aside a part of his garden as a private burial place for his family. Following his death the remainder of his land passed into other hands but, to ensure access to the burial ground, a slip of land down to East End Lane was purchased. This now forms part of The Twitten *. 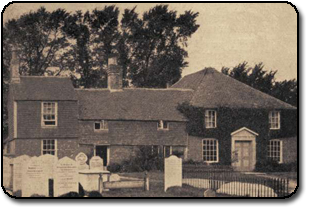 In 1984 the tiny burial ground was incorporated into the Old Meeting House Trust. Many notable characters have been associated with the Meeting House. Sir Adrian Boult was married here in 1933. During the marriage ceremony Walford Davies and Scott Goddard played the harmonium. Sir Adrian remained a member until his death. Others who have preached or lectured here at different times have included Mark Rutherford, G K Chesterton, Middleton Murray, Mary Stokes & Lord Sorensen. Until the 1689 Act of Toleration, other than during the rule of Oliver Cromwell, attendance at the established church was obligatory by law. The earliest General Baptist Church in England was founded about 1611. Because they would not obey that law their leaders were persecuted and put in prison. This forced the other members to meet in secret. Any stranger might be an informer. Thus arose the custom that marriage was restricted to those already members of their communion. Almost all of those who now lie buried in the graveyard were related either by marriage or descent. * twitten is an old Sussex word for a footpath, normally in a built up area between buildings.